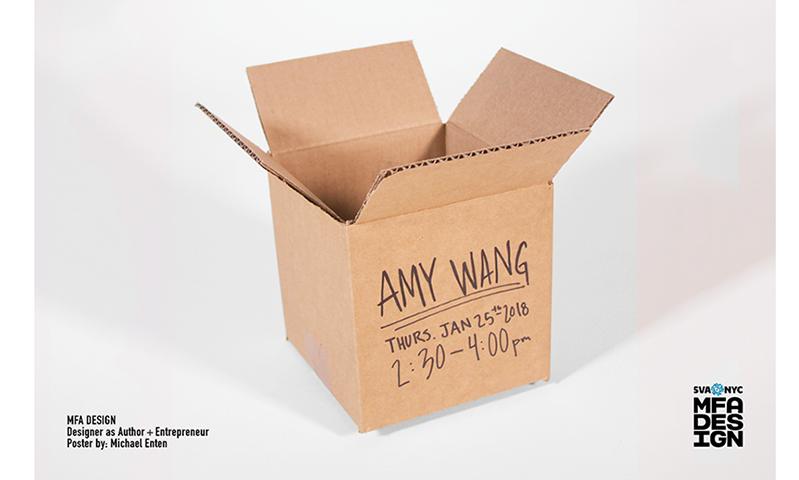 The first MFAD speaker for 2018 today is Amy Wang, a designer with a passion for human-centered design. Her dual background in science and design enables her to digest massive amounts of “unstoried” data and translate it into clear, compelling stories for and about users. At IDEO, Amy led visual design on multidisciplinary project teams using the design thinking process, with an additional focus in design research and strategy. Projects included helping Bloomberg Philanthropies migrate the Mayors Challenge competition from the US to Europe, eBay imagine the future of commerce, the DMV prototype to improve the waiting experience of its customers. Her work has been recognized by Communication Arts, Gizmodo, Adobe, among others. She will be discussing, among other things, what she does for NYU, Venture for America, and the nonprofit Publicolor. Amy is an MFAD 2006 grad, with a BA from Harvard. She is fluent in Spanish and Mandarin. When she is not untangling systems, she ponders where her next dessert will come from, and always welcomes suggestions.